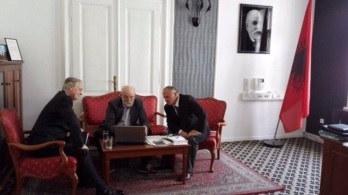 The Albanian ambassador to Slovenia Pëllumb Qazimi hosted the President and Vice President of “Rotary Club Ljubljana Centre,” Dr. Edward Kobal and Prof. Dr. Peter Raspor. In the light of economic diplomacy, the embassy of Albania in conjunction with Rotary Club Ljubljana are working on a joint project with view of promoting the traditional products of the two countries. Currently, the project is in the final stage before starting in the city of Ljubljana the event on 9 November on the occasion of St. Martin's Day.